The free version of image plus seems to have way more features then the paid version. 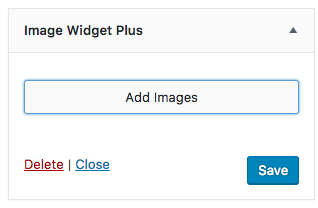 All I can see in the “Image Widget Plus” is an “Add Images” button, nothing else. Can I please have a refund. Please make sure my $29 a refunded. I can see all the options for Image Widget Plus are not showing, so there might be a conflict of some sort. Perhaps there is theme conflict or the plugin installation got corrupted somehow. I know you marked Deactivated all other plugins? Yes. Did you try switching to a default theme like twenty seventeen and see if any difference? If you want to give it a try, let me know and I’d be happy to help with the issue to make it work. On the other hand, if you confirm you want a refund I’ll go ahead and proceed with it. Thank you so much, Please proceed with the refund. I did no use your product. I’ve gone ahead and issued a refund for your orders and the funds should be back in your account within 5-10 business days.